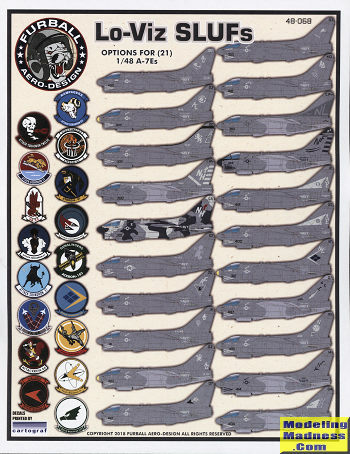 This particular sheet is quite welcome as it covers the low-viz era of the A-7E. There were experiments started in the early 80s using overall light gull grey and some other combinations, but by 1983/84, the Tactical Paint Scheme (TPS) has been finalized as FS 36320 over FS36375. 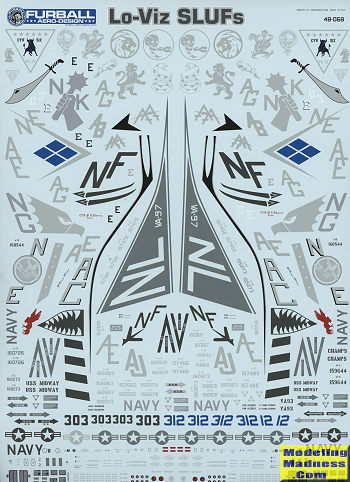 As it is today, these shades often blended into each other making the aircraft appear to be an overall color and some of those are portrayed on this sheet. Over the years there have been several 1/48 A-7Es kitted. The earliest was by ESCI, which despite how nice their 1/72 A-7s are, is really a rather horrid kit. Hasegawa came out with one in the 1990s that is still the standard for today despite the difficulty one can have building it. Hobby Boss produced a kit in the 2000s that is marred by a badly misshapen intake that is reminiscent of the old Monogram/Aurora A-7A kit. Unfortunately there is no aftermarket fix for this and so the Hasegawa kit remains the one to get and the kit for which this sheet is designed. 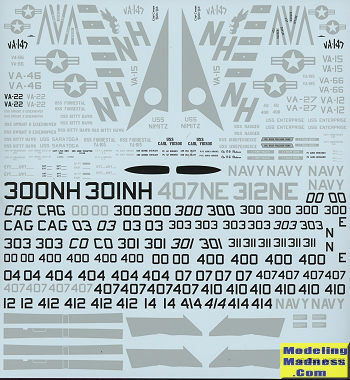 A nicely done sheet by Cartograf and you have sufficient insignia and data markings to do two planes. The instructions include data placement information.